Check in with Team FUV @ SXSW here, and listen in this afternoon for our biggest SXSW showcase yet - with Vampire Weekend, Dawes & more. Tune in Friday, March 15 from 1-7pm for our live show from the SXSW Day Stage: Charles Bradley, Dawes, Divine Fits, Emmylou Harris with Rodney Crowell, Iron & Wine, Pickwick and Vampire Weekend. FUV's Rita Houston says, "In the past we've been able to present some pretty noteworthy artists, such as Emmylou, Josh Ritter, Gary Clark Jr. and Punch Brothers on our own FUV Day Stage. This year, working with my colleagues, we're taking it to the next level: great radio stations banding together to present great music. And we're doing it in a way that's unique for public radio audiences." Public Radio Rocks SXSW Day Stage represents the first collaborative effort to transmit a piece of the live musical excitement of SXSW as it happens to public radio listeners. The annual SXSW (South By Southwest) music convention, now in its 27th year, is "the biggest and most anticipated convergence of all things music," offering compelling daytime programming and stellar nighttime showcases throughout the city of Austin. In addition to WFUV, the participating public radio stations are WXPN-FM/Philadelphia, KUTX-FM/Austin, KXT-FM/Dallas, and The Current/Minneapolis. Each station will broadcast the March 15 concert live on its airwaves and websites. Once again this year we'll bring you performances from the NPR Music showcase at Stubb's and capture other SXSW highlights, including video interviews with artists at the Hotel San Jose. See the current on-air listings here, and as they say, stay tuned. 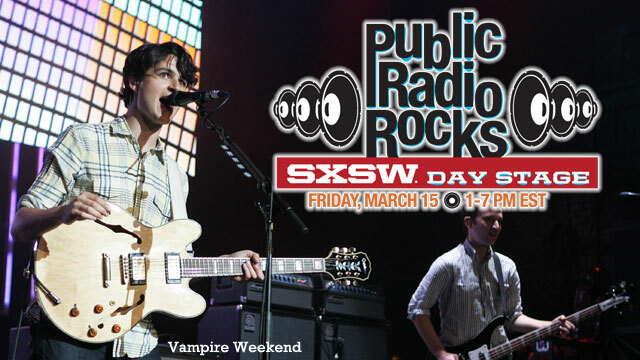 WFUV's South by Southwest 2013 music coverage is graciously supported by TuneIn.